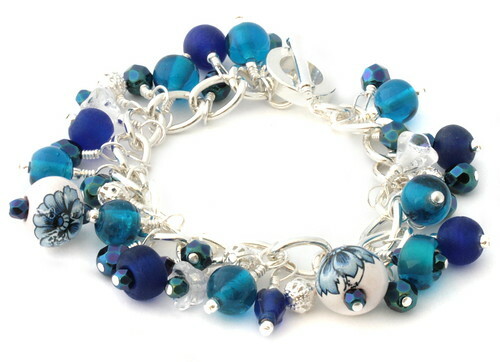 Lovely blues on this charm bracelet which was sent to Northern Ireland for a lovely lady's birthday along with matching nail polish, just in case she's getting bored of always getting jewellery from me! The two gorgeous floral beads are from a stash I'd collected during my GCSE Art, finally being put to use! Today is said lovely lady's daughter's third birthday and she received some fabric paints and glitter paints now that she is over frightening age warnings on product labels that I felt I couldn't ignore! Can't wait to see what she creates! I've had a go at making some clay beads and yesterday gave them a coat of white acrylic paint. They are not perfectly shaped and I quite like that! These big chunky ones are going to have something painted on them but I'm not sure what yet, perhaps some polka dots, perhaps a floral design, perhaps I'll mess them up and they'll end up just block coloured, brightly, as if I meant it. . . I'm enjoying using up some of my collections of beads and wire and can hardly wait to get moved, get some tools and to start on my new designs. I've been trying to source UK suppliers of recycled metals to make my jewellery as ethical as I can, if anybody has any recommendations I'd love to hear from you!